Pro football on Monday nights was not unprecedented, but as a regularly-scheduled weekly television series, which it became in 1970, it was an innovation. The American Broadcasting Company promoted the concept vigorously and provided resources for covering the games that the other networks typically used only for playoff contests. An entertaining trio of announcers Howard Cosell, Keith Jackson, and ex-Cowboys QB Don Meredith added to the showcase. 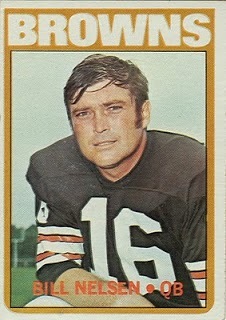 The first week’s contest on September 21, 1970 pitted the Cleveland Browns, an established NFL team that had been shifted to the American Football Conference as part of the merger (thus being aligned with former American Football League teams), against the New York Jets, champions of the AFL two years earlier. The Browns were coached by Blanton Collier for the eighth season and had advanced to the last two NFL Championship games. It was anticipated that, with recent success and grouped with three mediocre teams in the new Central Division of the AFC, that the Browns would contend. 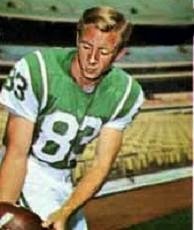 They had traded away star WR Paul Warfield to Miami in order to draft QB Mike Phipps out of Purdue, but veteran Bill Nelsen was still the starting quarterback. HB Leroy Kelly remained a major cog in the offense and they also had WR Gary Collins and TE Milt Morin. The team’s biggest questions pertained to the reshuffled defense. New York, coached by Weeb Ewbank, had followed up the 1968 Super Bowl season with a division-topping 10-4 record in ’69. Now in the AFC East, they continued to rely on QB Joe Namath passing to a good group of receivers led by Don Maynard and George Sauer and the running game featured FB Matt Snell and HB Emerson Boozer. The defense was good up front but questionable in the secondary. It was a clear night at Municipal Stadium in Cleveland with a stadium-record 85,703 fans in attendance and an estimated 35 million watching the telecast. The Jets punted following the first series of the game and Cleveland drove 55 yards in nine plays. Bill Nelsen had completions to Milt Morin for 13 yards and to FB Bo Scott for 21 and a third-down pass to Gary Collins was good for an eight-yard touchdown. Don Cockroft added the extra point. The Jets reached midfield on their next possession but again had to punt. Starting at their 16, the Browns drove to another score, going 84 yards in 11 plays. Leroy Kelly ran effectively and a pass interference call on a third-and-eight play kept the drive alive. In New York territory, Nelsen threw to Morin for 18 yards and to Scott for 15 and it was Scott running around end for the last two yards and a TD. Cockroft added the extra point and Cleveland carried a 14-0 lead into the second quarter. The Jets, relying primarily on runs by Emerson Boozer and Matt Snell, put together an eight-play, 61-yard series that resulted in Boozer plowing into the center of the line for a two-yard touchdown. Jim Turner converted and Cleveland’s lead was cut to 14-7. Nelsen completed a pass to Morin for 25 yards on the next series but the Browns ended up having to punt. The Jets also moved well, with Namath completing back-to-back passes to George Sauer (pictured at left) for 17 and 40 yards, but after reaching the Cleveland 17 Namath again looked to Sauer but was picked off by CB Walt Sumner, who returned it 34 yards. Following another Cleveland punt, another New York drive into Browns territory ended with Namath being intercepted once more, and the score remained unchanged at the half. 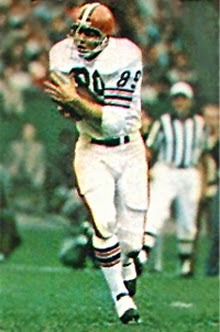 The Browns started off the third quarter with WR Homer Jones taking the second half kickoff and returning it 94 yards for a touchdown and, with Cockroft’s PAT, a 21-7 lead. In response, Namath came out throwing and immediately connected with Don Maynard for 20 yards and Sauer for 16 to reach the Cleveland 44. Another pass to Sauer picked up 13 yards and then Snell and Boozer accumulated another 13 yards between them on the ground. Namath found Sauer once again for an additional 13 yards and, two plays later, Boozer raced 10 yards through the middle for a TD to complete the 10-play, 80-yard drive. Turner converted and it was once more a seven-point contest. The Browns started their next series with favorable field position at their own 47 after a good kickoff return with a penalty tacked on. They advanced 47 yards in six plays and Cockroft kicked a 27-yard field goal. In their next series, the running of Snell and Boozer moved the Jets back into Cleveland territory, and Namath also completed two short passes. However, the drive stalled at the 42 and Turner’s 50-yard field goal attempt fell short. The Browns punted on the final play of the third quarter and New York again threatened to score. Snell ran for 19 yards on the first play of the series and, after five more running plays, a pass interference call on CB Erich Barnes put the ball on the Cleveland seven. But on the next play, Snell fumbled and DE Jack Gregory recovered to end the threat. The Browns responded with a long six-minute drive. Nelsen completed three passes, the longest to Morin for 22 yards, and Scott had a 17-yard run. But Cockroft missed to the right on an 18-yard field goal try. The Jets took over from their 20 with 5:40 remaining on the clock and, with Namath throwing on every down, they quickly moved 80 yards in four plays. Completions to Boozer, WR Rich Caster, and Sauer picked up 14, 19, and 14 yards, respectively, and a throw to Sauer was good for a 33-yard touchdown. Turner’s conversion put the visitors just three points behind at 24-21. The time was running down to two minutes as the Browns went three-and-out on their next possession, but Cockroft’s 65-yard punt had to be chased by DB Mike Battle, who failed to catch the ball at the 30 and downed it at the New York four. Four plays later, Namath’s pass was intercepted by LB Bill Andrews, who returned it 25 yards for a clinching touchdown. Cockroft again converted and Cleveland came away the winner by a final score of 31-21. The Jets dominated in total yards (454 to 221) and first downs (31 to 20). However, they also turned the ball over four times, to none suffered by Cleveland, and were penalized 13 times at a cost of 161 yards, to 8 flags thrown on the Browns. Bill Nelsen completed 12 of 27 passes for 145 yards and a touchdown with none intercepted. Milt Morin (pictured at right) had 5 catches for 90 yards and Leroy Kelly rushed for 62 yards on 20 carries. For the Jets, Joe Namath was successful on 18 of 31 throws for 298 yards and a TD, but gave up three interceptions, including the last one that led directly to the game-clinching score. George Sauer caught 10 of those passes for 172 yards and a touchdown and Don Maynard gained 69 yards on his four receptions. Matt Snell topped the ground game as he rushed for 108 yards on 16 attempts and Emerson Boozer contributed 58 yards on 15 carries that included two TDs. Following the exciting opening contest, neither team ended up meeting expectations over the course of the season. The Browns reached 4-2 before losing five of their last eight contests and ending up at 7-7 and in second place behind the third-year Cincinnati Bengals. Leroy Kelly’s performance dropped off due to an ankle injury and Homer Jones failed to fill the shoes of the departed Warfield (his kickoff return TD against the Jets was the highlight of his season). The Jets won their second game but proceeded to lose six straight on the way to a 4-10 record. Injuries were the key to New York’s collapse, with Joe Namath suffering a broken wrist and Matt Snell a torn Achilles tendon that sidelined them for most of the season. Pro football on Monday nights did not disappoint, however, and the program maintained consistently strong ratings in its first year and well beyond.